The combi boiler that combines absolutely everything! Our Combi Compact HRE heralds the start of a new generation of HE boilers. It combines absolutely everything. The boiler’s modern, compact design includes state-of-the-art technology dubbed ‘Double HE’. Our Combi Compact HRE combines high-efficiency hot water and heating. Which central heating boiler is the best for your home? You expect your central heating boiler to provide enough hot water for both your kitchen and bathroom, as well as enough heat to make all the rooms in your home cosy and snug. Our Combi Compact HRE is designed to do just this. The model that best suits your needs depends on your exact heating and hot water requirements. Whatever these may be, one of our boilers, either the CW3, CW4 or CW5, is sure to be a perfect match for you. Our Combi Compact not only provides high-efficiency heating, but unrivalled hot water efficiency, too. We call this ‘Double HE’. The secret lies in our patented two-in-one heat exchanger that ensures minimal heat loss and optimal heat transfer. Both central heating water and cold tap water pass directly through the heat exchanger cooling the flue gases and recovering as much heat as possible for reuse. 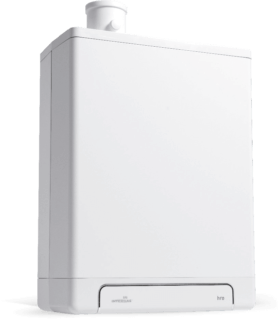 Our Combi Compact HRE A boiler assures you unrivalled efficiency and economy year in, year out.